At JC Jags, we have been in the wedding industry for many years, and there are a number of fantastic Melbourne wedding venues we visit time and time again. Ballara Receptions is one of these, and we recently delivered two stunning couples to this venue in with our best Eltham wedding car hire! 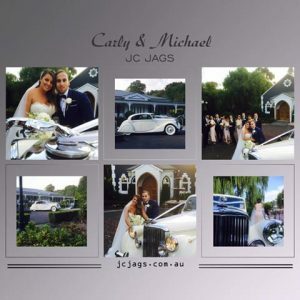 To Carly and Michael, and Jing and Daniel, we extend our heartiest congratulations and thank you for choosing JC Jags for your Eltham wedding car hire. Your weddings were beautiful, and we wish you all the best for a happy and bright future! Our Jaguars fit perfectly with the picturesque, classic style of Ballara Receptions’ Chapel and grounds. And as you can see from the photos, they make to great wedding pictures – just like these two loving couples! With a number of classic cars to choose from, including the Jaguar MK-V and Jaguar MK-VII, you won’t be disappointed! The experience for these couples didn’t begin and end with a safe, smooth drive. They received the JC Jags 5 star service, making the drive a glamorous and enjoyable beginning to a magical day! With any JC Jags Eltham wedding car hire, your chauffeur will treat you to red carpet service, including your choice of ribbon trim and a bottle of champagne for the newlywed bride and groom to toast their union! 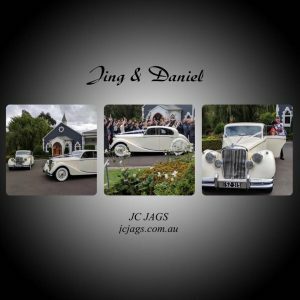 As a licensed member of the Victorian Taxi Directorate and the Victorian Wedding Car Association, JC Jags is committed to providing a quality service. If you are looking for immaculate, fully-restored Jaguars and top quality service, contact JC Jags – we have your Eltham wedding car hire sorted.